Creating Ice Centre table Pieces is a lot trickier and takes a lot longer than most people think. 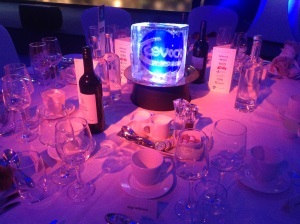 Keith Jones on behalf of the CEVA Awards 2019 approached us and asked if we could freeze in the CEVA logo to create CEVA Ice Centre Table Pieces. The initial answer naturally was, ‘yes we can’. and asking questions before saying ‘yes’. The Awards Ceremony / dinner was in 7-8 days of his phone call. It can take up to 7 days to create an ice block. How many Ice Centre Table Pieces I asked, “27” Keith replied. So, not one or two ice blocks then, but several ice blocks. Always ask if, ‘we’ have to create the insert or it has been already created? In this case, the Logos had already been printed and printed on not acetate or a laminate sheet (as we would normally do), but on thick Perspex. The thicker the insert material, the harder it is to freeze and harder for the ice block not to crack in two! Thickness in this case matters. “Where are the printed logos now?” I asked. “In my office”. Swadlincote, Derbyshire. “Around 8” x 8” Keith coolly said. “Are you sure? This is rather big for an Ice centre piece.” Keith said he would go and measure them. “My mistake, they are 7” x 7”. Now this is still on the large size. Not impossible but it would rule out them being tall, delicate and rectangular in shape. The final ice centre piece has to have the ‘right’ look, feel and proportions to be able to ‘work’. The only design in this short space of time to get them ready would be a cube and the logos frozen dead-centre. The CEVA Ice Centre Table Pieces looked bold, chunky and shimmered on the table with their underlit LED lights. Keith was pleased and so was the client so we are told, were pleased. If you are thinking of having Ice Centre Table Pieces for your event, party, Awards night or ANY event, please let us know at least two-three weeks in advance (preferably more) – to be able to get everything just as you want it, be prepared and be able to organize things.